I've recently taken to testing the waters of the self-published books on Amazon. I didn't have much interest until I read Helper12 by Jack Blaine (read my review here). I then went on to read The Boyfriend Thief by Shana Norris, which I enjoyed a lot (once again, my review here). I was browsing Amazon and found Flat-Out Love, which has over 200 reviews on Amazon and an average of 4 stars. I downloaded the free sample, was charmed, and read the rest in a day! Here's my review! Julie manages to escape her boring Ohio hometown for college in Boston only to discover that the apartment she rented was a scam, and she has nowhere to live. Her mother calls in a favor from her college roommate, and Julie moves in with the Watkins family. They're an eccentric bunch--Mr. Watkins is always traveling, Mrs. Watkins is a workaholic, and their son Matt is junior at MIT and a genius. Then, there's Celeste: a socially inept but brilliant teenager who hauls a cardboard cut-out of her oldest brother, Finn, wherever she goes. Finn, Julie is told, is backpacking abroad, and it's his room that she's occupying. As the weeks slide by, Julie becomes more and more involved in life with the Watkins, and begins an online friendship with Finn. Soon she begins to fall for the absentee Watkins, and she realizes that something isn't quite right in this household. Jessica Park will hook readers in immediately with her quick humor and spunky heroine. Julie is a very fun, upbeat, and witty protagonist and her descriptions of her misadventures and experiences living with a family she's only just met are very entertaining. For the most part, she's a very realistic character; she's happy to finally be free of her hometown, she loves learning, she's self-deprecating as she stumbles through her first year in college, and she has a big heart. However, sometimes Park does give Julie an attitude when it comes to appearing smart; Julie claims it isn't cool, and avoids it at times while reveling in her nerdiness at others. This imbalance is a little frustrating (seeming to be embarrassed at your own intelligence is so passé) but it does temper as you get further into the book. The Watkins household is quirky to say the least; their antics and peculiar habits are charmingly eccentric at first, and with Celeste and Matt as new friends and Finn as a cyber-friend, Julie is able to overlook the obvious underlying problems the family has with a bit of humor. But as she begins to fall for Finn, it becomes apparent to the reader what exactly has happened—even if Julie doesn't figure it out for herself until the end. 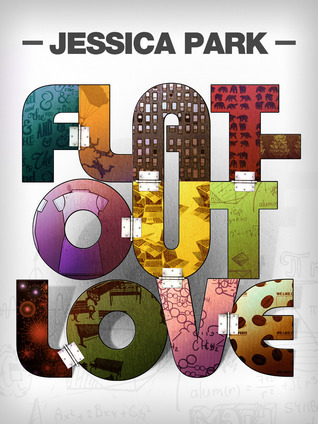 Despite its copious amounts of witty repartee and tongue-in-cheek Facebook status updates, at its core Flat-Out Love is a serious book about growing up, learning to deal with responsibility, facing painful truths, and finding a way to keep living life. The romance in this book builds slowly, but it is powerful. Despite the small dialogue inconsistencies and the slight stretch of imagination required to get into the story, this is a very enjoyable book full of a lot of humor and heart. Cover Comments: UPDATE--I replaced the image with the new cover, which is a VAST improvement over the old one. I love the font, the colors, and the depth of each letter. Awesome move to change it! I purchased this one from Amazon, where it's available for $2.99! Don't have a Kindle? You can download the free app to almost any device--computer, phone, iPod, whatever! I review plenty of self-published books and I'm 100% certain most of them have unattractive covers! It's unfortunate since some of them have great stories. I'm glad you got into reviewing self-published authors. I know they have a hard time because of the bad stories out there, but some of them are really good. Glad to hear you're giving them a chance and liking them! Anyway! This sounds quite good! :) I'm going to check out if it's available for me! Wow! You sold me on this on this book! First off, YAY FOR YOU for giving self-pubbed books a chance. While yes, there's a lot of crap out there, the rare gem is just waiting to be discovered. This sounds interesting--I'm intrigued by the secrets Julie manages to uncover, and the Watkins definitely sound like an eclectic bunch.